Short-Term Missions: So How Did it Go? Well, you went and you are back safe. Did the trip live up to your expectations? Steven: Yes, I was able to experience God in a way that many people here never will. I watched him work through our group and right into the people we were trying to reach. He made it possible for a group of people who don’t speak English very well to have an understanding of the gospel through people who speak only English. Kyle: I didn’t have many expectations because I didn’t know how or what the Philippines were like or anything. So I guess you could say that it rose above my expectations and was awesome! Deanna: We met so many wonderful people and had so many amazing experiences that we never could have expected. Alex: Yes, it did. It surpassed even what I imagined it would be. It extended my horizons and gave me many chances to grow as a person and in God. Steven: When we were in Bulacan doing a Vacation Bible School for the 12-year-olds, a group of kids gathered outside the windows and doorway. Janet saw that the students inside were being distracted, so she sent Kyle, Kassandra and myself outside to get them away from the building so that it wouldn’t be as noisy. There were only about 30 at first, but before we knew it there were over 200 kids out in the street. We played with them for over 2½ hours. 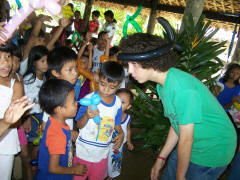 Even though the kids could hardly speak English, they understood our actions. We played games and just spent time with them. Deanna: There are too many to choose from! One was having Praise and Worship at the youth retreat (with 100 enthusiastic young people) in the pouring rain! God was clapping his hands! Alex: The whole trip was too amazing to pick one moment. It was all great, even the frustrating times were fun in the end. One moment that was really great was worshipping on the last day of the youth camp with all the kids. They jumped and sang and really loved to worship God. What was the low point, or the hardest part? Steven: The language barrier between us was the only constant test we had in working with the people. It was difficult throughout the entire trip, especially for younger children. Kyle: The low point of the trip was the long drive. Even though we had fun, it was still over 10+ hours in a van driving down to Bicol then again back up to Bulacan. 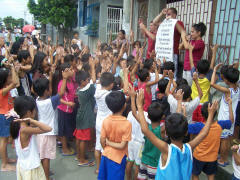 Deanna: I would say the hardest part was communicating to the kids the first day of VBS at the village in Bulacan. They did not understand much English, and the room we were in was so noisy because we had over 100 kids in a single room. We had to make changes in our plans and totally rely on God — but I think it worked out for the best. Did you have any trouble adjusting to the different culture? Steven: Well, taking a shower there is very different, for one, and having rice at almost every meal is definitely something to get used to, but overall I think the whole group adjusted quickly without any trouble. Kyle: The driving experience was the major cultural change in my eyes, but other than that, I really didn’t have to adjust myself for the culture change. Deanna: So many things I loved about the culture. The driving is so exciting — there seem to be no rules — just suggestions! I also love how friendly people are! I do admit that it was very difficult to find that there was no toilet paper in the restrooms — and most toilets do not flush on their own! Alex: I didn’t have too much trouble. I even noticed myself adopting some of their culture, like eating with a spoon and a fork. Some say that a short-term mission is a “life changing experience.” Do you feel it has changed you? In what way? Alex: Yes, the experience has inspired me to go on more mission trips as well as opened my eyes to the poverty that exists in this world. Steven: Yes, before we went on the trip some people I talked to said that it would be life changing, and they were right. Kyle: This has definitely changed me. During the two weeks, I found myself praying a lot more asking God to work through me and in turn, it brought me much closer to God. Deanna: This trip is definitely life-changing and eye-opening. We saw that there is so much need for people to hear about Jesus and to be taken care of for just the basic needs. I still can’t get over all the children we saw begging in the streets with such hungry eyes. But at the same time we saw so many youths who were so joyful—even with the little that they had—and they were especially joyful to worship God and share with others. I hope people in America will share that same enthusiasm! It felt so awesome to be able to go, and share God’s love with people who were ready for it! Now you have had the experience, what advice would you give to someone else about to embark on a short-term mission? Kyle: Go for it! It’s a blast, and you and the people you’re going to see won’t be let down. Deanna: Don’t be afraid — God takes care of us and blesses us no matter what country we are in. Also, just listen to the Holy Spirit and he will guide you — even if that means making changes along the way. I know that we touched many people, bringing them closer to God, which is a great feeling that I would love to experience again. Alex: Yes, this type of work and experience is something I definitely want to do in the future, because the trip was so amazing and it so passed my expectations. 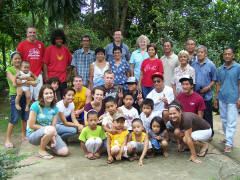 A short-term mission trip cannot do the work of full-time, long-term missionaries. But the participants nevertheless have a mission: to tell others about Jesus through words and actions. With proper planning and execution, a short trip can bring benefits to everyone concerned: the participants, their supporters, the churches in the host area, and those who learn about Jesus through the work that is done. A mission trip should always be done in conjunction with local churches, so that people will be connected with an ongoing source of help after the short-termers have gone home. The host churches benefit from an influx of energetic people who have set aside their normal schedules to focus on a particular task. Visitors from another nation spark interest, motivating the churches to advertise their event and providing incentive for people to come. Simply by being visitors, the short-termers can do something that the locals cannot. Financial assistance is often involved — people who can afford to travel also have money to help pay for event expenses, building repairs, supplies, etc. Some assistance may continue after the trip is over, too, as participants learn of additional needs. But any assistance, whether in personnel or finances, should not dwarf the local abilities so much that dependency or passivity is created. People in the host community benefit by hearing the good news of Jesus Christ, or receiving physical benefits such as clean water, medical help, building supplies, etc. People also benefit by being directed to a local church, a community of people who will continue to offer spiritual and in some cases physical help. Participants receive many benefits, too, usually starting even before they go. Some trips require extensive training, in which participants learn how to share the gospel in different ways and settings. And even if they don’t travel at all, a group of believers is likely to experience spiritual growth simply from setting aside their normal routines to live, work, and talk about the gospel with each other. As they travel, participants learn about the culture they are visiting and broaden their awareness of the world, noting economic disparities, different types of civil government, spiritual needs, and the diversity that exists not just in the world but also within the family of God. When things do not go exactly as planned, they pray, and then watch God work. In many cases they will learn from the zeal of local Christians, and bring some of that enthusiasm home with them. Those who support the travelers in prayer and finances also benefit, in part from the stories and zeal that the participants bring back with them. Photos—Janet Morrison, Orly Orsillos, Kassandra G.